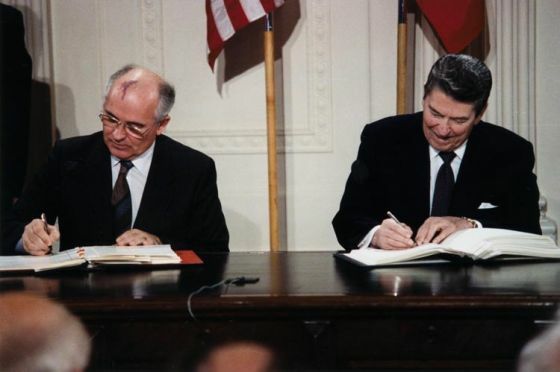 The 1987 INF Treaty broke the back of the nuclear arms race, completely changed the tenor of U.S. – Soviet relations, and ushered in previously inconceivable intrusive inspections. Ronald Reagan and Mikhail Gorbachev accomplished these results by rejecting nuclear orthodoxy. The New Start Treaty builds on these breakthroughs, but it doesn’t come close to abolishing entire classes of nuclear weapon delivery systems and reducing greatly the salience of nuclear weapons. The INF Treaty did both. The Soviet military threat remains just as great despite a great deal of soothing rhetoric… Even if Mr. Gorbachev should be completely honest and sincere in all that he has said, we have no indications whatever of how long he may remain in office and we do not know who or what his successor would be. Under those circumstances, it would be criminal folly for us to reduce the strength of our military, which after all was a key factor in producing much of the changed behavior we seem to be seeing now. It is a form of parochialism … to suggest that the Soviets have basically been deterred by a relative handful of warheads in Europe, none of which were deployed before 1983. [Deployments of Pershing and ground-launched cruise missiles that were eliminated by the INF Treaty began in 1983 – MK] It is the overall strength of America’s strategic forces that has been the principal element in Europe’s nuclear deterrent in the past and will remain so in the future. There is a widespread, deep and disturbing concern among our principal allies about the divisions in the US government. And the question, ‘Is America becoming ungovernable?’ is a very familiar question, one hears it frequently; it’s published frequently. The Soviets use arms control to impede the West’s procurements and deployments, to channel arms competition in directions disadvantageous to the West and to produce détente, the climate conducive to Soviet parasitism… The INF agreement… is a small price for the Soviets to pay for the consequent enhancement of conventional forces. Pat Buchanan confidently predicted that, “One day soon… we will all taste the ashes of disillusionment, the inevitable lot of every 20th-century man who has put his faith in treaties co-signed by totalitarians. The Berlin Wall began to be pick-axed in November 1989, ten days before Weinberger’s public warning. I was in Europe at the time and caught a flight to Berlin to pick up some pieces of graffiti-strewn concrete. The Soviet Union survived only four more years after the Senate consented to ratify the INF Treaty. To imply a relationship between the treaty and the fall of the Soviets is perhaps over-reaching. The Soviets’ time was up due to many factors and having a sane leader (Gorbachev) made it likely that sensible results would ensue — end of Soviets and signing of treaties that bring about predictability in international relations. Thanks for the reminder that if they were there then and we got rid of ‘em, what are the others doing there now? I have heard it said that NST will effectively put an end to a number of the more “intrusive” monitoring protocols, both in terms of in-person inspections and other modalities. I’d love to see some (more) discussion of this. The most heart-breaking aspect of David Hoffman’s The Dead Hand is the way in which one can see the miscommunications and poor understanding between the Reagan and Gorbachev governments. One really feels for Gorbachev — trying to disarm his own dysfunctional juggernaut, accused of build-up by the likes of Weinberger, and finding the U.S. side of the disarmament process to be as calcified and stubborn as the U.S. had found the Soviets a generation earlier. Hoffman does an amazing job of making these negotiations, and their behind-the-scene intrigues, symmetrical, but in the end it makes the Americans (including Reagan) just look thick-headed and obstinate, stuck in 1950s assumptions about the enemy and unable to recognize a real reformer when one showed up. One gets the impression that so much more could have been accomplished had the U.S. intelligence agencies, Congress, and all of Reagan’s advisors been a little bit more perceptive to the ways in which Gorbachev, the person, starkly differed from his predecessors. indeed the US position is still calcified; e.g. witness missile defense Reagan’s brain-dead-child. I, too, miss the old days when Presidents could lead on their principles, instead of triangulating their principles away.